Nederlandse Commissie voor Geodesie 43, Delft, 2005. 132 pagina's. ISBN-13: 978 90 6132 291 7. 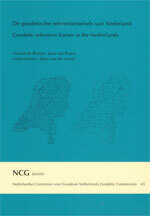 ISBN-10: 90 6132 291 X.
Voor het praktisch gebruik van GPS als meettechniek is de definitie van het RD-stelsel gekoppeld aan ETRS89. Het gebruik van GPS bracht echter vervormingen van het RD-stelsel aan het licht, die gemodelleerd worden in de transformatie RDNAPTRANSTM2004. Verder is de geoïde cruciaal geworden door de inzet van GPS bij hoogtebepaling ten opzichte van NAP. Door verticale bodembeweging wordt de ruggengraat van het NAP verstoord en is grootschalige bijstelling van de hoogtes van ondergrondse merken - en daarom ook van peilmerken - nodig gebleken. Sinds 2005 gelden dan ook nieuwe NAP-hoogtes en al sinds 2000 geldt een nieuwe definitie van het RD-stelsel, opnieuw aangepast in 2004. Unambiguous and homogeneous geodetic reference frames are essential to the proper determination of locations and heights. The reference frames used in the Netherlands are the Rijksdriehoekmeting (RD) for locations and the Normaal Amsterdamse Peil (NAP) for heights. 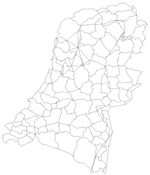 The RD has traditionally been managed by the Kadaster; the NAP by Rijkswaterstaat. The emergence of satellite positioning has resulted in drastic changes to these geodetic reference frames. A surveyor is now offered one instrument, GPS (the Global Positioning System), capable of the simultaneous determination of locations and heights. This is possible by virtue of one three-dimensional geodetic reference system - the European Terrestrial Reference System (ETRS89) - which in the Netherlands is maintained in a collaborative arrangement between the Kadaster and Rijkswaterstaat. GPS has been advanced as a practical measurement technique by linking the definition of the RD grid to ETRS89. Nevertheless the introduction of GPS also revealed distortions in the RD grid, which are modelled in the RDNAPTRANSTM2004 transformation. Furthermore, the use of the geoid model has become essential to the use of GPS in determining the height in comparison to NAP. Subsidence that has disrupted the backbone of the NAP gave cause to the need for a large-scale adjustment of the heights of the underground benchmarks and, in so doing, of the grid. Consequently new NAP heights have been introduced at the beginning of 2005; a new definition of the RD grid that had already been introduced in 2000 was once again modified in 2004. During the past few years two NCG subcommissions have devoted a great deal of time to these modifications. This publication lays down ETRS89, the RD and the NAP, together with their mutual relationships. In addition to reviewing the history of the reference frames and the manner in which they are maintained (including, for example, the use of AGRS.NL as the basis for the Dutch geometric infrastructure), the publication also discusses the status of the frames as at 1 January 2005. This encompasses the realisation of ETRS89 via AGRS.NL, the revision and new definition of the RD grid in 2004, and the new NAP publication in 2005. The publication also describes the mutual relationships between the frames in the modernized RDNAPTRANSTM2004 transformation consisting of the new NLGEO2004 geoid model and a model for the distortions of the RD grid. In conclusion, the publication also devotes attention to the future maintenance of the ETRS89, RD and NAP. The continuity of the link between the traditional frames and the three-dimensional frames is of great importance, and ETRS89 will continue to fulfil this linking role. The GPS base network and AGRS.NL reference stations will increasingly assume the leading role in the maintenance of the RD frame. The maintenance of the NAP will continue to be necessary, although during the coming decades the the primary heights will not need revision. In so doing the high quality of the geodetic reference frames required for their use in actual practice will continue to be guaranteed.